Valódi bőrből, egyedülálló, kettős övcsatos designnal készült minőségi karkötő. Az egyedi kettős övcsatos kivitel biztosan szembetűnő lesz a csuklódon! A karkötő mérete könnyen állítható 18 cm és 23,5 cmközött, ezért nagyon sokoldalú. Egy szép ajándéktasakban kézbesítjük. 18 cm és 23,5 cm között állítható - így univerzális méretű. A karkötő 5 cm széles. A karkötő valódi bőrből és nemesacélból készült. Looks just like in the picture. Perfect application, very good quality! Very good product. I'll buy another one! Bracelet of very good quality, which seems really solid. It was a gift for my spouse who has been wearing his bracelets for years and years, and he was delighted. Cruel quality and fit. Nice! Easy to shop. Good customer contact. Good bracelet in good quality. The description of the bracelet was good. very elegant bracelet, good smelling skin, husband was very pleased. size exactly as in the description, if someone has thick wrists, let them choose something bigger or more flexible. A good bracelet with good leather. Highly recommended. This bracelet closes neatly around the arm. The wide band fits exactly around the arm. This will be the case for most men. 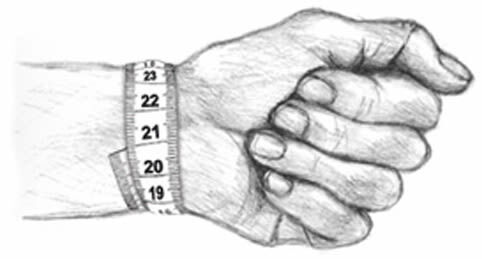 If you have thick wrists, the wide band may not fully fit. Price quality is good. Beautifully finished leather bracelet. Tough view. I can not evaluate because I bought them as a gift and I have not seen it live. However, I believe that the recipient of the gift is very happy because it was exactly what he wanted. The picture looks very good quality and the job is finished. Great emails you receive when ordering and delivery. It gives smile to the lip. Super fast delivery. Just good with info and delivery. Lacked some information on the site regarding delivery time ex. It looks very good. So after such short time I take a 4 star. Can only boast of this web page. Easy overview, short delivery time. Looks like there are good products. Thanks.